​Caeneus was a noted warrior in Greek mythology, and one held in high-esteem by another noted hero, Nestor. The story of Caeneus primarily comes from Ovid’s Metamorphoses, and in keeping with the “book of transformations”, Ovid tells of the transformation of Caeneus, for Caeneus was born female, but was transformed into a man. Caeneus was commonly said to have been the daughter of Elatus, a Lapith king, and Hippeia; making Caeneus sibling to Polyphemus, the Argonaut, and Ischys, the lover of Coronis. Alternatively, Caeneus might have been a daughter of Atrax, which would have made her sister to Hippodamia. The daughter of Elatus was initially known as Caenis, and when she came of age, Caenis was widely regarded as one of the most beautiful of all Lapiths, Suitors came from many a mile to try and woo Caenis, but she spurned all advances. One day, whilst Caenis alone by a river, Poseidon came to the land of the Lapiths, and taken by the beauty of Caenis, Poseidon had his way with the beautiful maiden. Commonly it was said that Poseidon raped Caenis, although some tell of Caenis willingly giving herself to the Greek water god. Poseidon would offer a gift to Caenis, and the Lapith chose to become a man, with some saying that she chose this gift in order that she could not be taken advantage of again. Poseidon would grant Caenis her wish, and Caenis became Caeneus; Poseidon also ensured that the skin of Caeneus was impervious to mortal weapons. Before the transformation of Caenis, the Lapith would give birth to three sons for Poseidon; Coronus, Phocus and Priasus, each of whom achieved some slight fame as heroes. Caeneus is often named amongst the hunters of the Calydonian Boar. 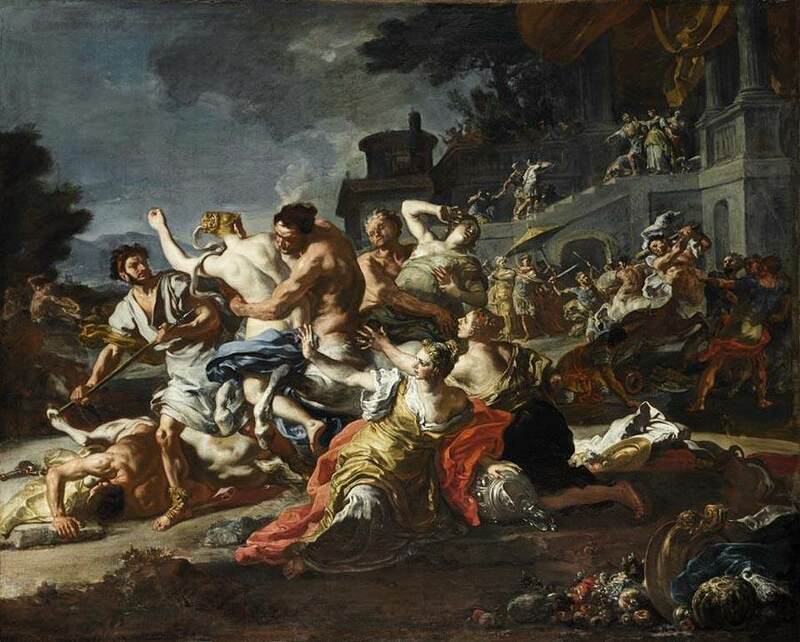 This was the gathering of heroes subsequent to the voyage of the Argonauts, in which the boar of Calydon was hunted down by a force led by Meleager. Caeneus though, was not given a prominent role amongst the hunters. ​As a warrior Caeneus is most famous for taking part in the Centauromachy, the war of the centaurs, and it a story famously recounted by Nestor to Achaean heroes at Troy in the Metamorphoses. Pirithous, the king of the Lapiths, was to wed Hippodamia, and the king of course invited his kinsmen, the Lapiths, to the festivities. Invitations were also sent out to others, including Theseus, Peleus and Nestor, and also the Centaurs, distant relations of the Lapiths. Drink would flow during the festivities, but as the Centaurs partook, so the alcohol reduced them to their base savageness, and the Centaurs thus decided to carry off the women present at the wedding, including Hippodamia. The Lapiths of course took up their weapons to rescue the female guests, and they were joined by the likes of Theseus, but amongst the Lapiths, alongside Pirithous, Caeneus was to the fore. In the early stages of the battle Caeneus killed five named Centaurs; Antimachus, Bromus, Elymus, Pyracmos and Styphelos. Despite his success in battle, another Centaur, Latreus, chided Caeneus for having been born a woman. Caeneus would throw his spear at Latreus, but his aim was slightly off, and only grazed the Centaur. Latreus himself would throw his own lance at Caeneus, but despite Latreus hitting Caeneus in the face, the lance caused the Lapith no injury, for Caeneus’ impenetrable skin protected him. Latreus would close in on Caeneus to use his sword, but neither thrust nor blow could harm Caeneus, and indeed the sword of Latreus would fracture through the effort. Caeneus then took up his own sword, and thrust it easily into the side of Latreus; Caeneus killing his sixth Centaur. A multitude of Centaurs then set upon Caeneus each throwing their spear at the Lapith hero, yet they met with no more success than had Latreus, for each spear fell to the ground, blunted by the skin of Caeneus. Seeing that weapons were useless against Caeneus, a Centaur named Monychus took the time to devise a new plan, and basing the idea upon the physical strength of the Centaurs, Monychus took up a fallen tree and hurled it at Caeneus, urging his fellow Centaurs to bury and suffocate Caeneus. The other Centaurs followed the lead of Monychus, and Mount Othrys was stripped bare of oaks, pines and firs, with each tree landing upon Caeneus, Even the immense strength of Caeneus could not free him under the weight of the trees, and so trees succeeded where swords and spears had failed. Some tell of how the weight of the trees pushed Caeneus deep into the bowels of the earth, but some others tell of how at the moment of his death, Caeneus was transformed into a tawny coloured bird which flew away from the battlefield never to be seen again. The other Lapiths, and their allies, would have their revenge for the death of Caeneus though, and soon half of the centaur lay dead, whilst the other half were soon fleeing for their lives, each carrying some sort of wound.